This is a rectangular Ice Cream Bar porcelain sign. 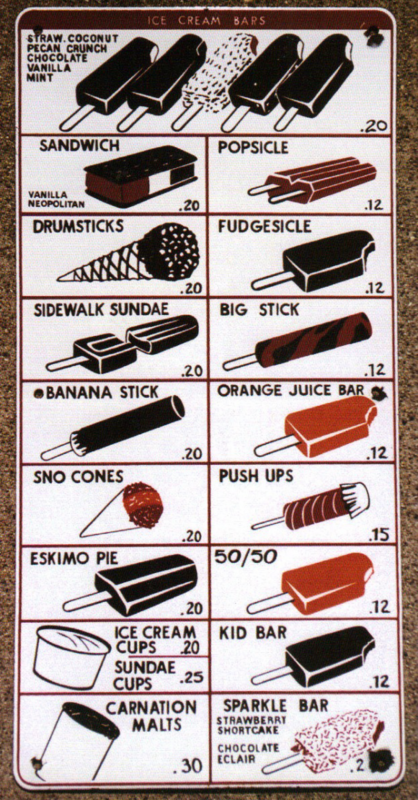 This particular Ice Cream Bar sign is predominantly white and features twenty-one different varieties of ice cream bars. It reads, “Sandwich, Popsicle, Drumsticks, Fudgesicle, Sidewalk Sundae, Big Stick, Banana Stick, Orange Juice Bar, Sno Cones, Push Ups, Eskimo Pie, 50/50, Ice Cream Cups, Sundae Cups, Kid Bar, Carnation Malts, Sparkle Bar”.